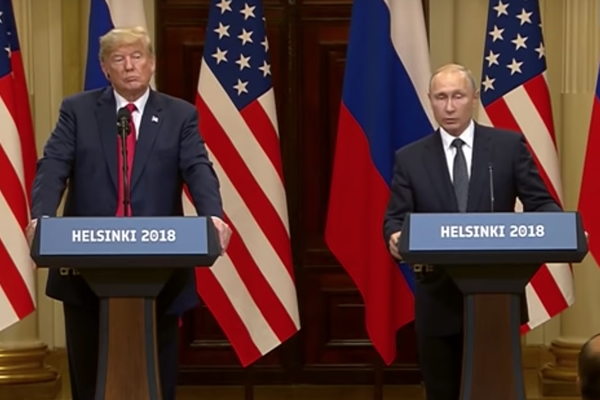 The news conference that followed President Trump’s meeting with Russian President Vladimir Putin in Helsinki led to jaw-dropping reactions across the globe, including from LGBT advocates and observers who say it had a negative impact on LGBT rights despite Trump’s backpedaling days later. Trump on Monday appeared alongside Putin at a news conference and sided with the Russian leader over the assessment of U.S. intelligence agencies and the Senate Intelligence Committee that Russia interfered in the 2016 U.S. election, which led to U.S. Special Counsel Robert Mueller’s indictment of 12 Russians who implemented the plan. Trump also referenced conspiracy theories about servers for the Democratic National Committee and 33,000 emails Hillary Clinton refused to make public during the election. Additionally, Trump embraced a Russian proposal for an internal investigation of the 12 Russians as opposed to calling for their extradition to the United States. Trump’s words gave credence to the notion Putin has compromising material on Trump that’s keeping the U.S. president under Russia’s control. When asked about it during the news conference, Putin cast doubt over the idea, but didn’t outright deny it. The comments during the news conference overshadowed the fact the meeting yielded nothing in terms of international policy, such as an agreement on nuclear arms reduction or Russian withdrawal from Crimea. LGBT advocates added to those concerns, saying the apparent deference to Putin undermined U.S. standing in advocating for LGBT human rights, especially in Russia which has a troubling record of anti-LGBT hostility. Recently, in the Russian semi-autonomous region of Chechnya, reports have emerged that local authorities have rounded up and even executed gay men in concentration camps. U.S. Ambassador to the United Nations Nikki Haley issued a statement last year calling the reports of Chechnya abuses “troubling” and the Treasury Department sanctioned Chechen President Ramzan Kadyrov late last year under the Magnitsky Act after the abuses were made public. However, Trump himself has yet to comment on them unlike other world leaders like Theresa May, Angela Merkel and Emmanuel Macron. David Stacy, government affairs director for the Human Rights Campaign, said Trump added to the debacle at Helsinki by not addressing anti-gay abuses in Chechnya. “I accept our intelligence community conclusion that Russia’s meddling in the 2016 election took place,” Trump said. Trump also said he misspoke when he said during the news conference he doesn’t see any reason why Russia would be responsible for the interference. But Trump’s reversal wasn’t enough for many observers who remain indignant over his performance in Helsinki. Michael Guest, who’s gay and a former U.S. ambassador to Romania, said Congress should step up efforts in the aftermath of the Trump-Putin meeting.